The long forgotten adventure destined to bring the Doctor face to face with the evil Skagra and his master plan. 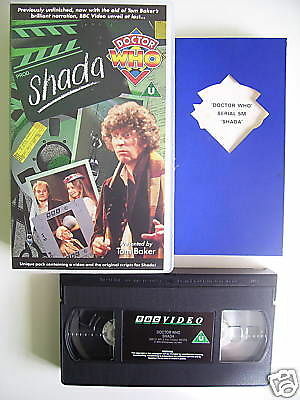 Recording of this 6 part adventure in 1979 was sadly never completed until now-with the aid of Tom Baker,Doctor No 4.Now all available filmed and recorded sequances are linked by his brilliant narration allowing BBC Video to unravil SHADA in its entirety at last. When one of the Artifacts of Gallifry-a dangerous book dating back to the time of the all-powerful Rasillon-goes missing from his study,Cambridge professor and retired Timelord Dr. Chronotis calls in the aid of the Doctor and Romana.The Doctor is very worried.Who knows what powers could be unleashed if the book falls into the wrong hands! Then mysterious Skagra arrives,armed with thought-draining sphere and a scheme for one universal mind.But first he must get hold of the book..This unique pack contains a video and a copy of the original scripts-a great addition to any collection. A MUST FOR ANY DOCTOR WHO FAN!!! !